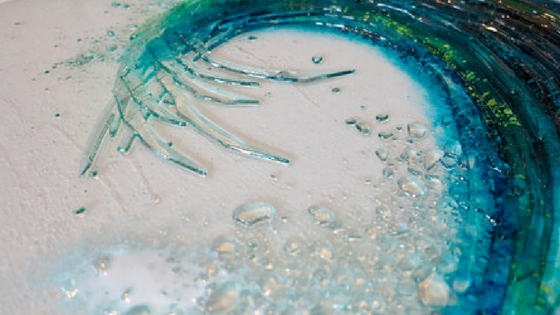 With a glass studio in Newquay, Cornwall, Dreya Bennett specialises in fused glass wall art. Working in interior design, I love to collaborate with local businesses to offer clients something unique and bespoke for their home decor. 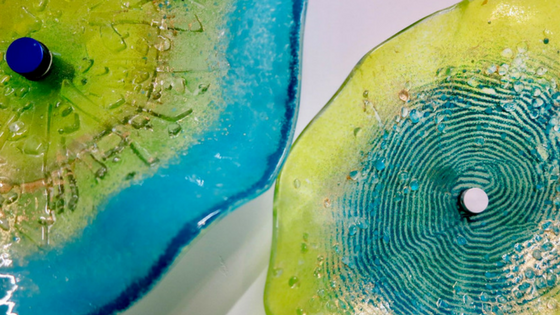 Dreya’s fused glass artwork uses colour and shape to create designs which are irresistibly tactile to the eye. I caught up with Dreya to talk about her love for glass and the sea. 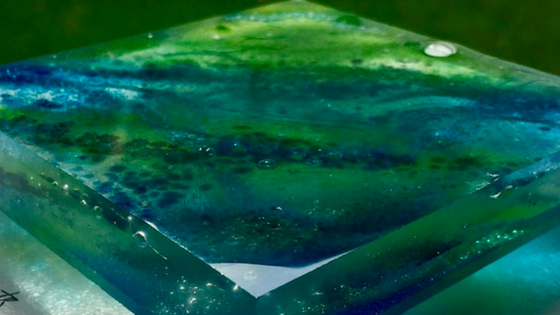 How long have you been a fused glass artist and what made you decide to use the medium you work with? I have been a full time glass artist for two years, however I cut my first piece of glass,(and conversely got cut by my first piece of glass), when I was in my teens. While studying at Falmouth University, I joined a stained glass evening class. I was instantly hooked on the process. I love the translucency, and especially the incredibly beautiful shadows, that glass casts. After my foundation course, I decided to study glass further, and undertook a degree in Architectural Stained Glass at Swansea. Though distracted from my glass for many years, I continued to make small projects from myself and friends and taught myself how to fuse glass. The sea is another huge passion of mine and I love to try and capture a little of its magic in glass. I have tried to show the many different colours and moods the sea has, though starting with a clear glass, as the sea itself it is clear. The sea’s colours come from the reflection of the sky and seeing the sand and rocks though the water. So I use frits, (different grades of crushed glasses), enamels, and copper oxides to add colour. I then cut many different pieces of glass and layer them over and over to create depth and interest to my work. The work can be in the kiln from 16 hours to 4 days depending on the size and thickness of the piece. What inspired your passion for glass? I love designing a new piece. The process of trying to recreate the ideas in my head into a physical piece of glass is most exciting! I always love to see the finished result; good or bad, surprising, and just plain awful. It’s the thrill of experimenting along the way! The processes and the possibilities are endless, I am constantly excited by new methods, new ideas and new techniques. It is impossible to become bored with glass, every piece can spark a new idea and direction. Can you discuss the significance of landscape and nature in your work? I moved to Cornwall from Africa when I was nine. Little did I know how much it would shape my life and how lucky I was. Even before we moved back to England, I was always a water baby. We spent most of our free time in a pool or on the beach, so the sea and its different moods have always been in my life, especially its sound, which can be carried many miles inland on the wind. 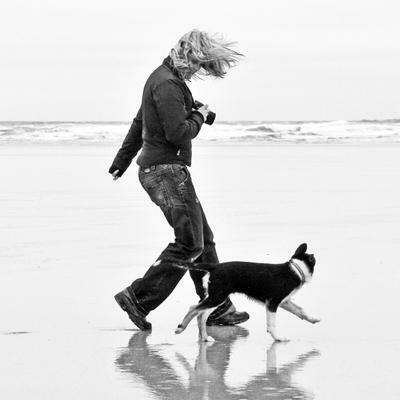 It is a constant background noise to life in Cornwall. It is all encompassing: its colour, sounds and smell, its reflections, translucent quality and constant movement can hold your attention like nothing else. I love to look at it, be in it, or on it. The sea has also given me two amazing careers. 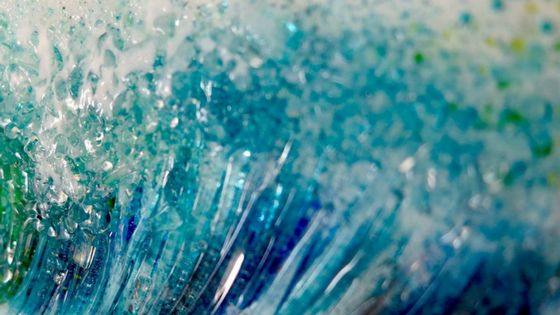 As a professional kite surfer, travelling to some amazing locations and setting a world record, kite surfing from Cornwall to Ireland, and now as the inspiration for my work, trying capture a bit of my love and the magic the sea has for me in my glass work. To me glass has a similar quality to water, (in fact technically glass is a fluid), as such it is the perfect medium to express it. Glass echo’s the feel and quality of water with its colour’s, reflections and translucent quality. It is enigmatic you can look at it, or through it. It is there and not there. The sea can change, minute by minute as the sun and clouds pass overhead. Glass also plays with light, and changes thought the day as the light moves across it or though it, casting reflections and colours. Are you currently working on a new project which you can talk us through? I currently have three new projects that I am working on, all in varying stages. I have developed a range of Sea Anemones in three different sizes, which are mounted, so that they stand slightly off a wall. The anemones can be arranged in huge groups or small personal clusters to suit any space. I particularly love the reflections that they throw onto the wall behind them. I am very excited that the mounting posts, (called a stand off), can be replaced by a stand off with LED’s in it, enabling it to become a subtle lighting feature as well. My other collection Ocean Currents is deeply satisfyingly tactile. 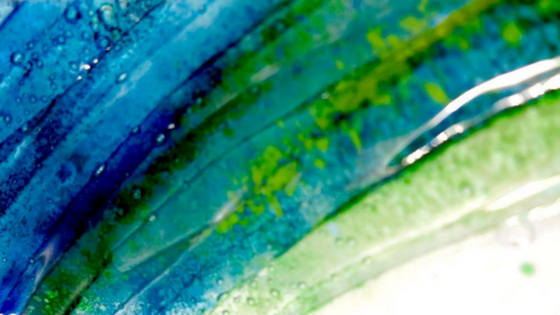 Thick chunks of glass can draw you into the depths of the piece, where you can see the bubbles and currents sliding though the work. The mesmerising mix of colours, becoming more intense as they overlap each other. Likewise, looking at the artwork from the side, seeing the layers and the bubbles rising up from the depths is most beautiful. I am working on thicker cuts of glass for this collection, playing with the shapes and edges of the glass, which most excite me. Lastly, I am working on a collection called Sea Bed. This is the most incomplete project and is proving the steepest learning curve for me, but is also the most exciting. I have been learning to 3D model and have been using a 3D printer to print my ideas. The models are then cast to create molds in which I am using to cast glass. I’ll admit, the results so far are very crude, but the opportunities and possibilities this workflow and method open up is so incredibly inspiring. I constantly battle to remind myself though that I have to run a business and earn a living, and can’t “play” every day! I am privileged and so lucky to be able to make glass for a living. Each day, I pinch myself every time I unlock the door and step into my studio in the mornings.